View More In Hooks - Page 5. 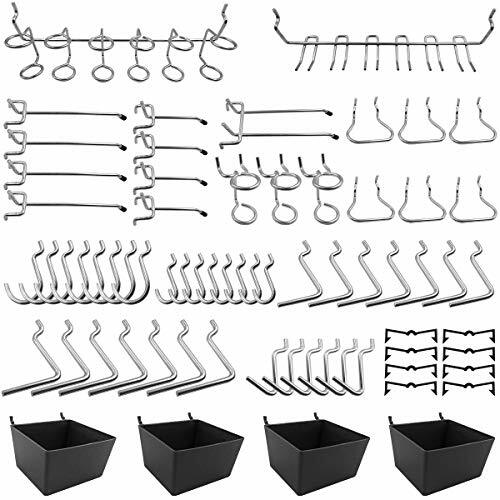 Package Contains - 80pcs 14 different types of pegboard hooks, such as j hooks for peg boards, screwdriver holders, pegboard bins, peg locks, U hooks, V hooks, etc. Universal Fit - Suitable for 1/8" and 1/4" pegboards with 1" spacing. Black Plastic Peg Locks - Simply clip over peg hook and lock into pegboard holes on each side, help the hook stay on the board. If you have any questions about this product by FRIMOONY, contact us by completing and submitting the form below. If you are looking for a specif part number, please include it with your message.